For months the media has been reporting on a state of crisis at Samsung. But a look at external market factors, including the resurgence of Apple's fortunes, quickly reveals how bad things really are for Samsung. Is this the downfall of an empire? If Android is so superior, why does everyone have Apple-envy? Samsung Mobile is accustomed to being the market leader; in the smartphone arena it has enjoyed unparalleled success as the highly visible mobile arm of a technology giant. Since the introduction of the legendary Galaxy S2 in 2011, Samsung Mobile’s star rose rapidly and for a long time was considered the financial model for the entire Android market. Apple had finally found some competition. The Galaxy S3 was a worldwide success and the Galaxy Note a triumphant innovation that introduced the world to the "phablet" – a large-screened smartphone that is currently the standard model for basically every smartphone manufacturer’s flagship device – and Samsung seemed unassailable. However, with the debut of the Galaxy S4, Samsung’s first critics were heard loud and clear with accusations of a lack of innovation. While sales did not diminish, Samsung reputation came out a little tarnished. Samsung was the unbeaten global number one smartphone manufacturer. But the winds of change were about to be felt. Galaxy S6 vs Galaxy S4: should you upgrade? But perhaps Samsung’s success went to its head a little and the company felt that it could do no wrong. By flooding the market with a myriad of indistinguishable and ultimately forgettable devices and a pretty severe lack of invention, now the company is stuck in the mire of a self-inflicted lack of brand loyalty and product weariness on the customer side and an increasingly visible and threatening group of competitors. The big problem seems to be that Samsung's strategy was focused on short-term success through ubiquity. The idea sounded good: flood and dominate the market. But, like the military campaign it resembles, after the victory comes the peacekeeping problem: how to sustain its position as market leader when it had spread itself so thin? For a long time Samsung managed to continue fumbling along with this misguided approach, but such a strategy is fundamentally incompatible with long-term success, because it left the company completely vulnerable to market fluctuations and new trends. What ultimately had to happen sooner or later finally did in 2014: a disastrous year for Samsung. The reception of the Galaxy S5 was just as lukewarm as it had been for the S4 and the quarterly figures, profit margins, unit sales and market shares took a nose dive. Even in Samsung’s traditional stronghold of South Korea things were looking bad. It's one thing when times are bad. That may simply represent a particular hiccup at one moment in time, just one phase in a grander, continuing success story. However, it is a completely different situation when your competition steps up impressively just when you’re on your knees. 2014 was not a bad year all round in the smartphone industry. It was in fact a great year for almost everyone except Samsung. While it can’t be said that these new players were responsible for Samsung’s woes, they certainly managed to capitalize on it. A brief overview of market performance demonstrates just how significant Samsung’s problems are in relation to the successes of its competitors. So what could otherwise have been considered merely a dry spell, a bad patch or a bump in the road starts looking more and more ominous and foreboding. Huawei: In 2014, the Chinese manufacturer Huawei sold 45 percent more smartphones than it did the year before (a sales revenue increase of 30 percent). LG: The Korean rival of Samsung also saw impressive growth in 2014, selling 24 percent more smartphones than it had in 2013. This translated to 16 percent revenue growth for the mobile division. Furthermore, LG’s smartphone sales in the US also rose by 78% in the fourth quarter of 2014, providing LG with a 125% growth in net profit for the year. Motorola: Despite Motorola’s troubles under Google, following the move to Lenovo’s stable, the brand saw a 118% increase in smartphone shipments, year-over-year. With the Motorola brand also set to return to China, these sales will be even higher in 2015 and Lenovo is forecasting a return to profitability in the next year or so. Sony: Despite the “great crisis” and mass layoffs amid speculation about the sale of the mobile division, Sony Mobile still managed to stay in the black in Q4 2014, and has sold over 12 million units (compared to 8.8 million in Q4 2013). That’s around a 40 percent increase. HTC: In Q3 2014, the Taiwanese manufacturer HTC finally made it back in the black, and Q4 brought the first sales growth since Q3 2011. Xiaomi: Record sales and rapid growth brought the young company Xiaomi into the spotlight, even briefly becoming the market leader in China ahead of Lenovo and Huawei. When you consider that most of Samsung’s Android competitors only claim a couple of percent of the global smartphone market, it is clear that Samsung’s main competition comes from another platform: iOS and the Apple iPhone. For a while Samsung had Apple on sheer numbers (if not profitability), but as of Q4 2014 – for the first time since 2011 – Apple once again claimed the title of the world’s number one smartphone manufacturer. In the fourth quarter of 2014, Apple made the highest net profit in the history of listed companies. The iPhone delivered sales of 75 million units in Q4 alone: a 46 percent increase compared to the third quarter of 2013. Even in China, Apple now leads the market (having dethroned Xiaomi recently) even though iPhones cost about double the price of your average Chinese device. In the US, Apple is also on top. In Korea too, which has always been an impregnable Samsung fortress, Samsung has begun crumbling as iPhone sales have exploded. Unless things change soon, it seems reasonable to assume that Apple will overtake Samsung even in its home market of South Korea. What does the future hold for Samsung? By surveying the entire smartphone landscape (but of course, not in infinite detail; I’ll leave that up to the analysts) you can see the real extent of the crisis that Samsung is facing. Strengthening competition on several Android fronts and a resurgence in the popularity of the iPhone have combined to exploit any weakness that Samsung may show in ways that only exacerbate the inherent problems the company already faces. Samsung’s swan song may have been a long time coming, but it seems at this stage there is little the company can do to turn its mobile business around significantly enough to counterbalance recent events. Unless Samsung manages to really impress with the upcoming Galaxy S6 and Galaxy S Edge, it looks as though the down trend will continue. From the leaks we’ve already seen it looks as if the great shift we had hoped for may not be coming, and it looks increasingly harder and harder for Samsung to successfully sway the opinions of the increasing number of smartphone users that feel that the company is out of touch and lacking innovation. The Galaxy Alpha, for example, felt a lot like Samsung’s de facto surrender to Apple, in that it seemed like the Samsung phone designed to appeal to iPhone users. But superficially copying Apple’s look when Samsung has a fundamentally different strategy at its core could never work. While Samsung had initially stood out from the crowd by making bold moves and introducing entirely new product categories, it was predicated on an unsustainable model that ultimately lead to so many imitators that Samsung couldn’t hold them at bay forever. Likewise, the iPhone clones in the Android world have simply provided even more competition for Samsung at the same time as Apple’s mimicking of Android has only made them stronger. How this tale ends we can only wonder at this point, but the ending now seems much closer than we ever thought before. What do you think 2015 will hold for Samsung? Where do you see it all ending? You write like the S3 was a wonderful product. It was not. If you live near a cell tower, it may be fine. If you don't it is terrible. The antenna in the S3 is horrible if you are more than about 2 miles from a tower. I'll never buy another Samsung phone. S4 is what I referred to.....sorry that could well be an isolated occurrence.....it happens. I used a Note S3 and was pissed due to the fact that I couldn't get serviced at Samsung service centers outside the country I purchased the unit, and thats one factor, the main fact that twas operational terms...i.e. region or country. I find that mighty stupid of Samsung to go down the apple road, coming up with these control gimmicks..
Samsung began to Zone our phones -yes our phones, which limited coverage even service centers....I have 3 Samsung phones in my family and they'll be the last but it certainly won't be replace by any Apple product. Offering more content isn't all that matters rather pricing & freedom of use, unfortunately Samsung seem to hedge on Apple periphery of both hi prices & (NSA FBI)control......I hate it! 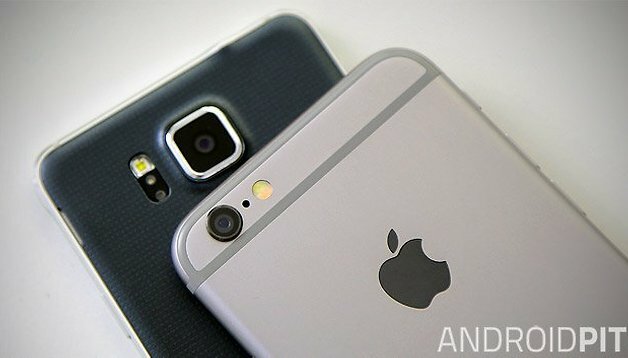 I like samsung phones but I have to say that androidpit is right about the lack of innovation between the S3 and S4 series. In my opinion the S5 is a damn good phone but a sporty one hard in taking. here was the fault of samsung not bringing an premium version of it but the recognized it too late that there are users who want a phon with durability (imo the S5) and there is a huge amount of the ones who like a premium one like an assesoire which you can present (imo IPhone). now samsung might have found the key finally!!!!!!!!!!!!!!!! In 2014 HTC, Motorola and LG took sales from Samsung, Apple only sold to their existing customer base. Its no more complicated than that. I've always had samsung products, to me they are way ahead of anything else, I won't have any other brand!! A lot of people who write them off are usually jealous, who haven't even tried them, samsung will bounce back they always do, world beaters in innovation and products that are utterly brilliant! !! Let me guess Madars you are an apple fan. Of course he is there's always one or two trolling these. I've never owned a Sony phone, but I definitely came close to breaking from Samsung to go with Sony instead of buying the S5 I got. I'm hoping the s6 and s6 edge live up to the expectation with all the leaks that are coming through. The s5 sounded a great device leading up till the unveiling event, then it turned out to be very disappointing and didn't offer enough improvements than the s4. Turned out to be a meh moment. I know it was a complete let down. I still bought it though. I hope Samsung will stop making phones because i hate this company. The worst phones ever made. I respect you're right to an opinion even if it's not based of facts and extensive experience with Samsung products. Utter BS. Before you write something or someone off, make sure you know what you're talking about first. Definitely exaggerated article can't help but laugh at all these doomsday articles. Samsung still made more revenue in 2014 than Htc, Sony, Motorola, and LG all together.